Olaf was born in Red Lake County, Minnesota on September 21, 1896. He filed on a homestead at 5-75-8-W6, near La Glace. When Olaf was drafted in May of 1918, he was living in Tofield, Alberta. He died of pneumonia on August 22, 1918 at the Connaught Military Hospital, one week after arriving in England. Thomas was born ca. 1899 in Glasgow, Scotland. 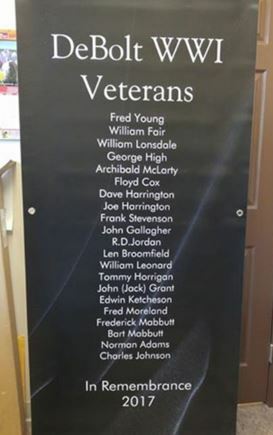 It is possible that he served in the British Army. In 1929, Thomas filed on the eastern half of 20-71-26-W5. Arthur was born in Markham, Ontario on February 14, 1889 (1883?). Prior to the war, he served in the Royal North West Mounted Police. In April of 1918 Arthur enlisted in the Canadian army; in October, in the last weeks of the war, he arrived at the front lines in France. After being discharged, he returned to Canada and searched for a homestead in the South Peace, eventually settling near the forks of the Red Willow and the Wapiti. When World War II broke out, Arthur joined the Veterans Guard of Canada and worked in various prison camps. Arthur died on October 9, 1954. Edward was born in Lancaster, England on September 8, 1884, but immigrated to Canada before the war. After his discharge, he settled near Goodfare (20-72-12-W6). Though the exact date of his death is uncertain, Edward died on or before February 5, 1950. He had been living alone and when he'd not been seen for a few days, his neighbor, Alf Wilkie, went to check on him and found him dead, sitting at his table. Joseph was born in Castleside, Durham, England on August 20, 1896. By the time of his enlistment in July of 1915, he had immigrated to Alberta (his homestead may have been located at 14-33-5-W5). Joseph was wounded twice - on October 12, 1916 at the Somme, he received shrapnel wounds to his left thigh and right foot, and in September of 1918 he received a gunshot wound to his right arm. According to his military service file, his address in 1922 was in Sawridge, Alberta. Joseph died on February 10, 1955. William was born in London, England on December 18, 1892. He came to Canada in 1913 to visit his aunt in Nova Scotia, and gradually worked his way west to the Peace River country in Alberta. William enlisted in the Canadian army in June of 1917. In August of 1918, he received a gunshot wound to his right arm. William came back to Alberta and homesteaded in Bezanson (SW 32-71-2-W6 and NE 19-71-2-W6). He lived there until his death on June 21, 1952. Charles was born in London, England on April 1, 1884. In April of 1914, he filed on NW 31-71-2-W6. On September 19, 1914, Charles enlisted in the Canadian Army at Valcartier. He married 'R' around October 1917. They returned to Canada after Charles was discharged and he filed on an additional quarter adjoining the homestead he first filed on, NW 31-71-2-W6, in 1919. Errol was born in Belfountain, Ontario on December 16, 1897. When he enlisted in November of 1916, Errol and his mother were living in Spirit River; Errol's homesteads were located at 35-75-3-W6 and 9-78-5-W6. In February of 1923, Errol was charged with the murder of George Murray, but he was acquitted in June of that year. William was born in Nashua, Iowa on June 1, 1876. He enlisted in Grande Prairie on September 21, 1915. On October 10, 1916, just four months after arriving in France, William died at the Casualty Clearing Station Special Hospital in Warloy-Baillon, France. He had been wounded in the legs on the German wire and bound up his own wounds and those of two other soldiers. According to Col. Griesbach's battle report, "German bombers endeavored to bomb the shell hole... he caught the German bombs in his hands and threw them away... he crawled away from his shell hole and was again bombed; endeavoring to catch and throw these latter bombs away, one of them exploded in his hands..." Col. Griesbach gives further details of Hannigan's injuries and journey to the Field Ambulance where he died of his wounds (see link below). Sven was born in Amicivej, Copenhagen, Denmark on June 1, 1874. Prior to enlisting in the Canadian army January of 1916, he served in the Danish army. Sven sprained his right knee in August of 1916. According to his service file, he was living in Prince George in 1923. Sven died in Vancouver on May 4, 1964. Allen was born in Carievale, Saskatchewan on September 18, 1891. He came to Happy Valley in 1929 and homesteaded at SW 18-78-8-W6. As well as serving in the First World War, Allen also joined up for the Second World War and was stationed at Suffield, Alberta in the British Block as a guard. Charles was born in London, England on September 27, 1881. He was quite young when he arrived in Canada, as RNWMP records indicate that he joined the force in 1900. In 1913 he was transferred to Lake Saskatoon. At some point, Charles filed on a homestead at 22-74-7-W6. Two years later, in November of 1915, he went to Edmonton and enlisted in the Canadian army. Only six weeks after arriving in France (October 1916), Charles was suffering from varicose veins, for which he had already had surgery in 1907. He could not march, but it was recommended by the doctor that he be put to work with the horses "as he states that he has a certain amount of veterinary knowledge." Charles claimed he was not bothered by his condition and wanted to return to France, but neither he nor the doctor got their wish. He was stationed in England until his discharge; his leg operated on again in July of 1917; and he was finally discharged on September 27, 1917. According to his medical record, Charles stated that he had been shot in collarbone (right side) by an escaped prisoner in 1897. After returning to Canada, he rejoined the RNWMP. Charles died while stationed in Whitehorse on December 11, 1922. Robert was born on February 1, 1892 in Reston, Manitoba. He came over the Edson Trail in 1914 with his father, Alfred Wesley Harper, and two brothers, Wesley and Wilbur. They settled in the Pouce Coupe area. Robert enlisted in January of 1916, leaving behind his wife, Mabel Lillian, and their young child. On October 8, 1918, he was awarded the Distinguished Conduct Medal for gallantry and distinguished service in the field. Robert died in Pouce Coupe in 1987. Wesley was born in Reston, Manitoba on April 13, 1896. He came over the Edson Trail in 1914 with his father, Alfred Wesley Harper, and two brothers, Robert Lester and Wilbur. The men settled in the Pouce Coupe area. Wesley enlisted in September of 1915. In September of 1916, three months after he got to France, he received shrapnel wounds to his back, left arm, and legs at the Somme, near Courcelette. David was born in Ancaster, Ontario on December 6, 1890. He and his brother Joseph both served in the Canadian army during World War I. After his discharge in 1919, David came to the South Peace and filed on homesteads at 26-70-25-W5 and 25-70-25-W5 in the Sturgeon Heights area. In 1925, he married Nellie Crotty; they had one son named Willie. David worked as a fire ranger during the summers from 1924 until 1944. In 1933, he donated the land on which the Sturgeon Heights school was built. Dave died on October 19, 1944. Joseph was born in Ancaster, Ontario on July 22, 1892. He and his brother David both served in the Canadian army during World War I. Joseph injured his hip, left thigh, abdomen, and left ankle in September of 1917 while riding on a rail car loaded with steel. It collided with a tractor, and the tractor did not give enough clearance for the overhang of steel. Joseph came to the South Peace in 1919 and filed on homesteads at 24-70-25-W5 and 25-70-25-W5, in the Sturgeon Heights area. He died in January of 1974. Lawrence was born in Lindsay, Ontario on December 3, 1893. He had come to the Peace Country before the start of the war, and returned to his homestead in 1919 after his discharge. His homesteads were located at 8-79-5-W6 and 32-78-5-W6. Lawrence married Eva Fitton a short time later; they had no children. He worked as a lineman for the government telegraph and helped to put in all the telegraph lines in the Peace River country. About 1930 Lawrence was moved north to Keg River where he worked as a government agent for the telegraph, telephone, and postal services until he died in 1975. Charles was born in Missouri on March 24, 1896. He came to the Clairmont area with his parents in 1911. Charles was drafted in the summer of 1918 and although he shipped overseas, he remained in England and never saw action at the front lines in France. After the war, he settled in the Kleskun Lake district (23-72-5-W6 and 2-73-5-W6). On June 27, 1923 Charles married Clara Lee Turner. He died in March of 1975. Harrison, Reverend H. W. L.
Reverend Harrison was a bachelor who had suffered from shell shock in World War I; he came to Grande Prairie from Montreal in May of 1932 to take charge of the Anglican church in the area west of Lake Saskatoon. He resigned in May of 1934 and returned to England. Frank was born in Nottingham, England on December 5, 1881. He filed on a homestead at 15-73-8-W6, across the road from his brother Ernest. On July 14, 1916, a month after arriving at the front lines, Frank was killed in action. He was buried in the Railway Dugouts Burial Ground, a mile southeast of Ypres. George was born in Hudson's Hope, BC on July 7, 1889. He had a homestead at 20-80-4-W6, near that of his brother Roland, who was also a veteran of the war. George enlisted in the Canadian army in January of 1915. He suffered from many ailments during the war - trench fever in May of 1916, gunshot wounds to his left leg and left eye in October of 1916, and rheumatic fever in July of 1917 at the Somme. George's left eye had to be removed, and he also suffered from defective vision in his right eye. In November of 1917 he was invalided to Canada, and while staying in a convalescent home in Calgary, George was diagnosed with "arrested tuberculosis." He was discharged from the army in March of 1918. George died on September 19, 1954 in Enilda, Alberta. Roland was born on December 24, 1890 in Grouard, Alberta. He traveled to Valcartier to enlist in September of 1914, at the very beginning of the war. Roland had a homestead at 28-80-4-W6, near that of his brother George, also a veteran of World War I.
Charles was born in York County, Ontario on January 4, 1872. He worked as a miner as a young man and one of his legs was shorter than the other, due to a mining accident in 1903. Charles came over the Edson Trail in 1914 and filed on a homestead in the Sexsmith area (SW6-74-4-W6). He returned to his homestead after the war and eventually purchased a second piece of land at 15-74-3-W6. Charles died in 1924. Murray was born on January 30, 1893 in Nova Scotia. He came out west to farm with his brother before the war, filing on a homestead at NE 16-73-11-W6, which he later abandoned for SE 26-73-11-W6. In 1916, Murray and his brother Aubrey went to enlist in the army but Aubrey was turned away because of an old hip injury. Murray did not return to Alberta after the war but settled in Nova Scotia instead. He died in 1963. Gordon was born in Mandan, North Dakota on January 5, 1885. At the time of his enlistment in April of 1917, he was living in Calgary, Alberta and working as a "trainman." After being discharged in 1919, Gordon filed on SW 18-74-22-W5. He died in Calgary in 1963 and was buried in the Burnsland Cemetery. John was born in Blackburn, England on January 4, 1891. He joined the British army in 1914 and served in France until he was wounded in action in 1916. On October 10, 1925, John married Florence Elizabeth Large. Shortly after their marriage, they came to Canada and settled in the Peace River area in 1926. John purchased a quarter section at SW 31-71-2-W6. He died on July 20, 1976 and was buried in the Glen Leslie Cemetery. Henry was born in Cranborne, Dorset, England on November 16, 1893. He enlisted in Edmonton in February of 1915. In September of 1916, Henry fell into shell hole in France and was run over by a cart; he was not injured too seriously, having sunk down into the mud, but was still sent back to England for a short time. On August 15, 1917, at Hill 70 in France, Henry received a gunshot wound and compound fracture to his left hip and thigh. It took many operations to remove all the bone fragments and and he spent the remainder of the war in hospitals. Henry lost proper function of his hip, and his left leg was 1.25 inches shorter than the right. He was invalided to Canada in September of 1918. Henry came to Teepee Creek in 1919 and filed on a homestead at 13-74-4-W6. He sold out and moved to Galiano Island in British Columbia, and died on July 29, 1968 in Kelowna. Patrick was born in Crookstown, Cork, Ireland on August 16, 1883. He settled in the Sexsmith area around 1915 and filed on homesteads at NW 32 (31)-73-4-W6 and 8-74-3-W6. Patrick was drafted at the end of 1917 and served only in England. He was discharged as being medically unfit (abscess of lung) in January of 1920. Patrick married Katie Hopkins later in life. In 1940, he sold his farm and moved to Vancouver, where he died in 1945. Harvey was born in La Broquerie, Manitoba on January 3, 1895. He arrived in the Peace country in 1914 and filed on homesteads at NE 12-78-21-W5 and 13-78-21-W5. Harvey was drafted in March of 1918, but defaulted and was brought to Edmonton by the police in April. He deserted again a few weeks later. Harvey never served in the army or returned to the Peace country, and what became of him was never discovered. Ed was born in Logan, Iowa on February 10, 1889. He came to Canada in 1913 and settled in the South Peace in 1914. Ed's homesteads were located at 23-71-10-W6 and 22-71-10-W6. In July of 1915 he enlisted in the Canadian army. Ed received a gunshot wound to his left leg on October 30, 1917 while serving in Belgium, and to his right leg in 1918. He was discharged on February 17, 1919 and returned to his homestead. On October 8, 1920, Ed married Laura Davis. Because of Ed's injuries, they rented out their farm in 1926 and moved to White Rock. However, they returned in 1930 and resumed farming. Ed and Laura had four children. During World War II, he spent two years serving in the Veterans Guard. Ed died in March of 1988. Arthur was born in Lytton, BC on January 26, 1883. He owned a homestead at 14-70-9-W6, near the Wapiti River. At the time of his enlistment in August of 1915, Arthur was married to Elizabeth Margaret West and they had a son named John. They lived in North Vancouver. Arthur's brothers Francis, Harold, and John also served during World War I. Arthur was killed in action at Courcelette on November 18, 1916 and was buried about 20 yards in front of Battle Headquarters, 10th Street Trench, Somme. Cliff was born on June 21, 1889 in Wawanesa, Manitoba. He and his brother Ernie came up to the Peace country in spring of 1911. Cliff filed on SW 19-73-10-W6 in the Hythe area. He was drafted in July of 1918 and served with the Canadian army in Canada and England. Cliff returned to the South Peace after the war and, through the Soldier Settlement Act, was granted another quarter section at NE 8-73-11-W6. On May 2, 1934, Cliff married Josephine Gass. They lived on the farm until about 1970, then moved to Campbell River, BC to live nearer their children and grandchildren. Cliff died in Campbell River on July 18, 1988. Francis was born in British Columbia on October 10, 1896. He filed on a homestead at NW 14-70-9-W6. Francis enlisted in Calgary in May of 1915; his brothers Arthur, Harold, and John served in the Canadian army as well. Francis appears to have served only in England. A possible explanation is that his feet were calloused and grew worse with service, possibly due to having been frostbitten nine years earlier. In July of 1918, Francis was given permission to marry Doris Hilda May. According to his service file, he was living in England in the early 1920s. Harold was born in Vancouver, BC on July 9, 1891. He filed on homesteads at 3-70-9-W6 and SE 23-70-9-W6 but it is uncertain at what time he may have lived here. Harold enlisted in Vancouver in November of 1914; he listed "surveyor" as his trade. His brothers Arthur, Francis, and John served in the Canadian army as well. In September of 1916, Harold received gunshot wounds to his back and left leg, but he recovered from these wounds. On November 6, 1917, Harold died of shrapnel wounds to the head at the No. 17 Casualty Clearing Station. His grave marker is inscribed with "Love can never lose its own." John was born in Vancouver, BC on May 31, 1889. He filed on homesteads at 23-70-9-W6, 14-70-9-W6, and 3-70-9-W6, but gave Los Angeles as his present address when he enlisted in July of 1917. His brothers Arthur, Francis, and Harold also served during World War I. John was killed by an enemy sniper while operating a Lewis Gun near Damery on August 17, 1918. Murry was born in Anthony, Kansas on August 8, 1889. He was living in Wakita, Oklahoma when he joined the American Army. In 1917, Murry filed on SE 19-74-5-W6. William was born in Bonnhein, Germany on October 27, 1891. When he was drafted in May of 1918, William was living in Lake Saskatoon (18-73-8-W6). He served only in Canada and England. In 1919, William married Sarah, a Scotswoman. Charles was born in Stratford, Essex, England on February 10, 1890. When he enlisted in July of 1915, he was living in Peace River. Charles was wounded several times during the course of his military career. He received a gunshot wound to his left buttock in September of 1916 at the Somme (this injury was reported in the Grande Prairie Herald); to his back in August of 1917 at Lens, in the Battle for Hill 70; and finally to his right forearm in September of 1918 at Cambrai. Charles died on December 12, 1958. Gerard was born in St. Phillip, Quebec on November 23, 1880. At the time of his enlistment in April of 1918, Gerard was living in Duluth Minnesota. Because it was so near the end of the war, he served only in England. After being discharged in 1919, Gerard filed on a homestead at NW 1-78-20-W5. Donat was born in Papineauville, Quebec on December 24, 1894. He filed on a homestead near Falher, at SW 28-77-21-W5. Donat was drafted in July of 1918 and served only in Canada. He died in April of 1976. Abram was born in Hanna, North Dakota on August 5, 1894. He was living in Knee Hill, Alberta when he was drafted in May of 1918. Abram served only in England. In December of 1918, Walter Hibbert filed on NE 14-74-6-W6 on Abram's behalf. In 1920, Abram filed on SW 24-74-6-W6. Raymond was born in Montreal, Quebec on June 17, 1893. He was farming in Spirit River (16-77-5-W6 and 0-78-5-W6) when he was drafted in January of 1918. Raymond served only in England. George was born in Sullivan County, Pennsylvania on April 19, 1878. He enlisted in Prince Rupert, BC in February of 1916, so it is assumed that he settled in the Peace country after the war (30-70-24-W5 and 36-70-25-W5). George died on November 9, 1954. George was born in County Cork, Ireland on July 1, 1887. He came to the Peace country in 1914 to help put up telegraph line. George enlisted in Lake Saskatoon in October of 1915. He was wounded twice during the war; a gunshot wound to his left thigh in September of 1916 at the Somme, and once again to his left leg in May of 1917. George's leg was fractured when he was shot the second time, and after it had healed, his left leg was about 2.5 inches shorter than the right. In his discharge papers, George stated: "I may say I have never received reparation for my mother, whom I can honestly say needs the money. Otherwise I am quite satisfied with everything. I am my mother's sole support." George married an Englishwoman from Bristol, who came to Canada on the first ship carrying civilians to North America after the Armistice. He died on August 10, 1973 in Victoria. William, or Ed, as he was known, was born in Portage la Prairie, Manitoba on October 2, 1890. He enlisted in Red Deer in December of 1915. Ed became dangerously ill with pneumonia in December of 1916 and was in hospital until May of the following year. Sometime at the end of 1918 or beginning of 1919, Ed married Ethel Hilda May Hallebane, an Englishwoman from Sussex. The couple came to the Peace Country after the war and filed on a homestead at NE 24-74-6-W6 He later purchased NW 12-74-6-W6 as well. Around 1968 or 1969, Ed and Ethel moved to Merritt, BC, where Ed died on August 24, 1970. Frederick was born around 1889. He served in the 2nd Battalion, Royal Welsh Fusiliers during World War I. He died on November 27, 1975 at the age of 86 and was buried in the Grande Prairie cemetery. James was born in Texas on June 23, 1875. 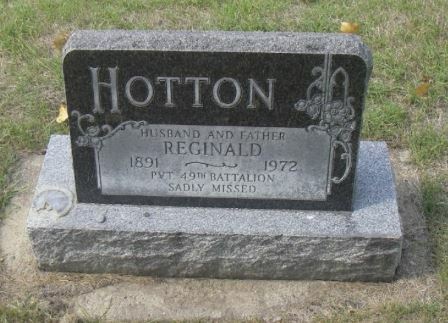 He was living in the South Peace when the war began (his homesteads were located at SE31-71-7-W6 and 31-71-5-W6) and enlisted in the army in September of 1915. James's brother was killed in action. In February of 1919, James was taken of a troop train headed westward across Canada because he had the mumps. When he arrived in Edmonton in March, James fell on a sidewalk and fractured his right wrist. He died on January 13, 1974. David was born in Tobermory, Ontario on August 13, 1888. He enlisted in December of 1915, but was discharged just months later in March of 1916 for being medically unfit (he had a weak right leg). David and his wife Evelyn Annie came to the Bad Heart area in 1919 and settled on the eastern half of section 30 (30-75-2-W6). His younger brother Thomas also enlisted in the Canadian army. Thomas was born in Wiarton, Ontario on July 31, 1900 (he lied about his age on his attestation paper and wrote 1897). His older brother John David Hill came to the Bad Heart area after the war, and in 1928, Tom came to join him and filed on homesteads at 30-75-2-W6 and 19-75-2-W6. He returned to Ontario in 1929 and married Rea Brown; they returned together in spring of 1930 and raised a family of three children. In 1963, Tom and Rea retired to White Rock, BC, where Tom died in July of 1974 at the age of 73. Sidney was born in Southampton, England on February 17, 1887. He filed on a homestead at 5-71-8-W6 and enlisted in the Canadian army in July of 1915. Sidney arrived in France in June of 1916, and on October 3 of that year he was killed in action at Courcelette. There is no record of his burial, but he is listed on the Vimy Memorial. Bill was born in Norwich, England on April 1, 1894. According to his attestation paper, he was a musician, and he played in a Canadian orchestra during his time in the army. John was born in Birmingham, England on May 2, 1896. He came to the South Peace as a young man and filed on a homestead at 25-71-7-W6. John was drafted in June of 1918. On November 10, 1924, he married Dora Clark. John died on November 11, 1951. John was born in England in 1882. During the war, he served in Egypt and Palestine; at one point he spent time in a hospital where Edith Hibbs was matron. In June of 1920, John married Ethel Hulme in London, England. John had traveled in Canada as a young man, so when hard times threatened Britain after the war, he brought his wife and their small daughters, Peggy and Irene, to Canada. They settled in the Flying Shot Lake area in 1926. John filed on a homestead at 21-70-7-W6. 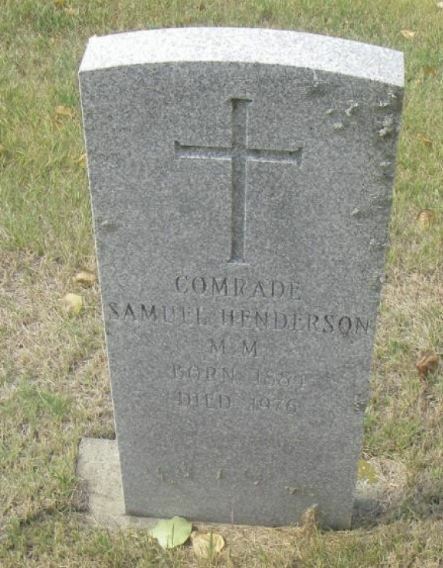 He died on September 18, 1953 and was buried in the Grande Prairie Cemetery. Bill was born in Hereford, England on December 23, 1889. He came to Canada in 1913 with Percy Stephens, though it wasn't until 1915 that they came to the Peace country and filed on homesteads in Beaverlodge (16-72-10-W6). Bill traveled to Moose Jaw to enlist in April of 1916. He was severely wounded at Passchendaele on November 6, 1917; he received shrapnel wounds to his left leg, left arm, and face. Bill was dangerously ill for a few months after this injury and on December 31, 1917, his leg was amputated. He was sent back to Canada in June of 1918. On August 30, 1920, Bill married Edith H. Stephens, whom he had met in London during the war when he went there to visit with Percy. Edith had come to Canada in 1919, after being discharged from the Women's Army Auxiliary Corps. The couple farmed in the Beaverlodge area until 1948, when they retired and moved to Langley, BC. Bill died in Langley on December 9, 1955 and was buried in Albright. Dean Hodgins was born in Port Rowan, Ontario on May 1, 1894. At the time of his enlistment in September of 1915, he was living in Grande Prairie (his homesteads were located at 36-71-7-W6 and 31-71-6-W6). A letter from the front written by Private Keith in July of 1916 suggested that Dean had had "cold feet," though articles were published soon afterward to give the true story (see the attached news clippings). Shortly afterward, in September of 1916, Dean went missing in action, though this was not reported until March of 1917. It was later discovered that Dean had been killed during an attack on enemy trenches near Courcelette on September 26, 1916, just three months after arriving in France. Louis was born in Brussels, Belgium on July 19, 1884. He came to Donnelly in 1914 and filed on a homestead at SW 7-78-20-W5. Louis was married to Therese at the time of his enlistment in December 1915. He deserted within months of enlisting and did not return to Donnelly after the war. James was born in London, Ontario on February 2, 1880. He enlisted in Edmonton in August of 1915. James received shrapnel wounds to his right leg, ears, and shoulder in September of 1917. In 1919, after being discharged from the army, James came to the Peace country and filed on a homestead at NW 4-76-21-W5. He never married, and died in Guy in 1929 (1927, according to his homestead record). Miles was born in Poplar Grove, Saskatchewan on November 9, 1892. At the time of his enlistment in January of 1916, he was farming in Whitewood, Saskatchewan. Miles was awarded the Meritorious Service Medal in 1919. In 1923, Miles married Mary. They came to the Grande Prairie area in 1943 and in 1947 settled on SW 12-74-7-W6. Miles died on May 3, 1955 and was buried in the Grande Prairie cemetery. Robert was born in Bolton, Lancashire, England on October 7, 1878. He was living in Goldfield, Nevada and working as a miner at the time of his enlistment in January of 1918. In March of 1919, Robert was absent without leave for almost six days. After being discharged in 1919, Robert came to the South Peace and filed on a homestead at SW 24-80-14-W6. He was a ranger at Muskeg in the early 1930s. Robert died in Victoria on September 26, 1963. 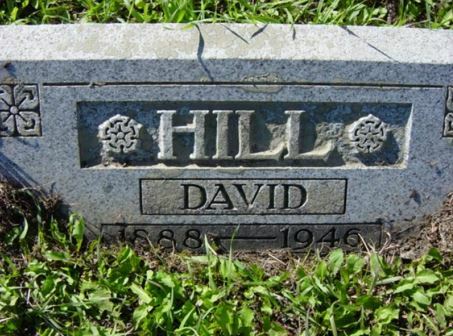 David was born in Listowel, Ontario on April 6, 1894. He came to Sexsmith as a young man and was farming there when he was drafted in 1918. David received a gunshot wound to the neck in October of 1918, but survived the war and returned to his farm in Sexsmith (26-73-6-W6 & 25-73-6-W6) in spring of 1919. David died on October 2, 1954. George "Rusty" was born in Eckington, Derbyshire, England on August 17, 1890. In 1905 he came to Canada alone to join his brother in Winnipeg. He enlisted in the Canadian army in Valcartier in September of 1914. In September of 1915, Rusty felt foreign matter in right eye, he was unsure if it was dirt or piece of shell (the incident took place at Armentieres). He was sent to England in November and the doctor found that he had an ulcer caused by the presence of the foreign matter. Rusty spent a few months in hospital as a result and afterward served with military police in England. In 1919 Rusty filed on a homestead in the Teepee Creek area (7-74-3-W6 and 17-74-3-W6). A year later, in 1920, Rusty and his wife Gladys came by train to Sexsmith and settled on their homestead. Rusty was president of the Teepee Creek Stampede for a number of years, and in the 1940s trained 16 local girls who became known as the Teepee Creek Riding Girls. Rusty died on July 19, 1981. William was born in Eckington, Derbyshire, England on April 25, 1875 (1876?). 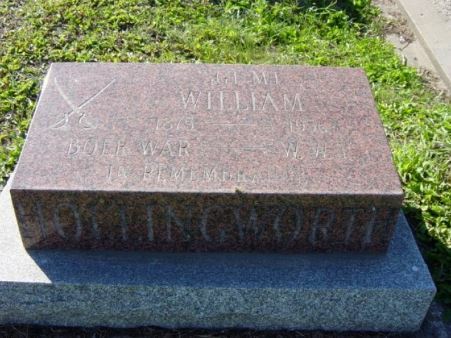 He served in both the Boer War and World War I. William was married to Charlotte Elizabeth when he enlisted in the Canadian army in September of 1914. They were living in Winnipeg at the time. After the war (possibly around 1920, with his brother George "Rusty" Hollingworth), William and Charlotte settled in the Teepee Creek area. Charlotte died in 1949, and William on September 12, 1956. He was buried in the Teepee Creek cemetery. Joseph was born in Winslow, Prince Edward Island on April 7, 1889. In February 1915, he came west and filed on NW 20-74-6-W6. Two months later, Joseph enlisted in the Canadian Army. In 1926, Joseph sold his farm and moved to southern Alberta where he worked in the mining industry. Clifford Stanley Hook was born in Somerset, England in 1884. Jessica Beatrice Williams was born in Weston-Super-Mare in 1887. Clifford and Jessica were married sometime before 1909. The Hooks and their young daughter immigrated to Canada in 1913. They stayed a while with Jessica’s brother in Regina before moving to Edmonton to find work. While in Edmonton, Clifford, a jeweler and watchmaker, was employed by G. F. Watcher for five years, as the expert in the repair department of Watcher’s jewelry business. A son, Herbert E. Hook (Ted) was born in 1914. Although Clifford tried to enlist during World War I, he was refused for medical reasons ("not likely to become an efficient soldier"). The Hook family moved to Grande Prairie when Clifford purchased the R. H. Watcher business in March 1918. When he formed a partnership with Mr. J. Leonard shortly thereafter, the business became known as Hook & Leonard. Realizing that the Peace country was in need of professional eye care, Clifford left Grande Prairie briefly and went to Ontario to attend the College of Optometry. His family remained in Grande Prairie during the period. Clifford graduated April 20, 1920 and returned to Grande Prairie, becoming the first Optometrist in the region. Upon his return he continued in the jewelry business and added an Optometry section. In 1920, the Grande Prairie store burned down. Leonard decided to try farming north of Sexsmith while Clifford continued practicing optometry and opened a new store. In May 1926, C. S. Hook closed his Grande Prairie jewelry and watch repair shop and moved the business to Waterhole. At various times, Clifford also operated jewelry stores in other towns including Sexsmith and Wembley. He owned a homestead located at 8-74-8-W6. A second son, Robert Clifford Hook, was born on June 12, 1918 in Grande Prairie. A third son, Jack Edgar Hook, was born on November 5, 1926. After spending 15 years in Grande Prairie, Jessica Hook moved to Vancouver for medical reasons, taking her three sons with her. Clifford and Evelyn remained in Grande Prairie. Jessica died August 16, 1940 in Edmonton at the age of 53 and is buried in the Edmonton Cemetery. She had moved to Edmonton a year before her death. C. S. Hook died in Grande Prairie on December 16, 1966 at the age of 87 after falling and breaking his hip. Andrew was born in Lima, Ohio on December 17, 1896. In 1914, he came to Sexsmith with his father and five siblings. He was drafted in May of 1918 and never saw active duty in France. Andrew returned to his homestead (5-74-4-W6) after the war and brought his bride with him. He died in Lima, Ohio in January of 1974. William was born in Horton, Kings County, Nova Scotia on April 14, 1897. He was married to Annie and working as a miner at the time of his enlistment in November of 1914. William received a shrapnel wound to his left thigh in June of 1918, south of Arras. In 1923, he was living in Grande Prairie (6-71-6-W6). On August 7, 1936, William was found dead. Examination by Dr. O'Brien determined that he had died of heart seizure. William was buried in the Grande Prairie cemetery. Thomas was born in London, England on January 7, 1898. He married an Englishwoman named Elizabeth in 1918 or 1919, while he was serving in the Canadian army overseas. Thomas and Elizabeth settled in the Sexsmith area in 1924 (24-74-4-W6 and 3-72-1-W6). They adopted a son while living in the area, but left when he was school age. Thomas died on March 9, 1965. Harold was born in Toronto on October 7, 1890. He came to the Peace country as a young man and filed on homesteads at 16-72-4-W6 and 5-72-5-W6. Harold was married to Mary Ellen Horning, whose address was listed as Edmonton, Alberta on his attestation paper. On October 25, 1916, Harold was killed in action in the trenches north of Courcelette. Reginald was born in La Malbaie, Quebec on June 21, 1891. He came to the Peace country before the war and settled on a homestead at 30-72-6-W6. Reginald died in Clairmont on April 29, 1972 and was buried in the Grande Prairie cemetery. Joseph was born in Paris, Ontario on November 16, 1886 (1888?). He came west to Alberta as a young man and enlisted in the Canadian army in Edmonton in April of 1917. After the war, in April of 1919, Joseph returned to Alberta and settled in the Dimsdale area (NW 14-71-7-6 and 32-71-26-W5). In June of 1920, he married Mary Dennis in Spirit River. In 1939, Joseph and Mary and their three children moved to Grovedale. Joseph lived in the Grovedale area until his death in 1975. Matt was born November 1, 1897 in Sarni, Ukraine. At the age of 18, he joined the Austrian army as the Ukraine was under Austrian rule at that time. He served in Italy, then in the area between Russia and Rumania, and finally on the front lines during the 1918 revolution. Matt was captured by the Polish army and was a prisoner of war at Scholkova. In June of 1926, Matt arrived in Halifax. From there he came west and eventually settled in the Peace River area in 1930. Matt married Anne Solomiany in 1932. They had two daughters. In 1976 they sold their homestead and moved into Spirit River. Matt died on May 24, 1992. Edgar was born in Cottonwood County, Minnesota on July 10, 1892 (or July 12, 1891). He first enlisted in Edmonton in January of 1915, but was discharged on May 11 as he was "not likely to become an efficient soldier." In September of 1915, Edgar enlisted again, this time in Lake Saskatoon. This time he was accepted. Edgar received a gunshot wound and fractured his jaw in September of 1916 at Albert, France. According to his service file, Edgar was living in Pouce Coupe in 1922 (his parents also lived in Pouce Coupe at the time of his enlistment. William was born in Glen Valley, BC on May 31, 1896. He was living in Lamont, Alberta when he was drafted in May of 1918. William suffered from chronic bronchitis, as well as an impairment of speech and hearing and was sent to a convalescent home in Canada after the war. He homesteaded north of Northmark in 1929. William died in November of 1972. Russell was born in West Dalhousie, Nova Scotia on October 17, 1894. After serving in France and Belgium during World War I, Russell met and married Ella Borden in Halifax The came to the New Fish Creek area in 1937 and filed on a homestead at NW 30-72-21-W5. Russell died in Valleyview on November 9, 1978. John was born in Glasgow, Scotland on December 25, 1887. He was living in Grande Prairie when he enlisted in June of 1916. He died of wounds (shrapnel wounds to leg, face, and arm, as well as a compound fracture) at the No. 7 Casualty Clearing Station on October 2, 1917. Nathaniel was born in Rockton, Ontario on August 30, 1896. He came to the Peace country with friends from Edmonton and settled in the Bezanson area in 1916. Nathaniel was drafted in the summer of 1918 but though he made it overseas to England, he never served on the front lines in France. In 1920 he returned to the Bezanson/Glen Leslie area (2-72-3-W6 and 6-72-3-W6). Nathaniel married Mabel Robideau Whalen on October 25, 1933. She was a widow with two children, Robert and Eunice. Nathaniel died in 1956 and was buried in the Glen Leslie Cemetery. Victor was born in London, England on April 25, 1897. He came to Canada in 1914 and was living near London, Ontario when he enlisted in May of 1916. After being discharged, Victor returned to Canada. He overheard a soldier in front of him stating Edmonton as his destination, and so Victor too answered Edmonton when his turn came. He settled in the Bad Heart area in summer of 1919 (3-75-2-W6 and 4-75-2-W6). His friend Percy Trendall came to the Peace country with him and homesteaded nearby; the had gone to school together in England, and had enlisted and been discharged on the same day. In 1939, Victor married Jennie Smichura. They had three children. Victor died on May 7, 1970. Harry was born in West Hartlepool, England on February 27, 1887. He enlisted in Lake Saskatoon in September of 1915. His homestead was located at 1-73-7-W6. On October 12, 1916 he was reported "missing, believed killed," after having been previously reported missing. In February of 1917, he was officially reported as having been killed. According to his circumstances of death register, Harry was killed in action on September 26, 1916 at Courcelette, two months after arriving in France. His grave marker is inscribed with "For God and country." Leonard was born on February 28, 1891 in Winchester Springs, Ontario. He was living in Jumping Pound, Alberta when he enlisted in March of 1916. In August of 1918 at Amiens, Leonard received a gunshot wound to his face. The left side of his face was completely paralyzed as a result. Leonard was invalided to Canada in December of 1918. In 1919 Leonard settled in the Five Mile Creek area. He married Ellen May Broadbridge in 1930; the couple had four children. Ellen died in 1940. When World War II started, Leonard once again volunteered for service but was denied due to his injuries and his young family. He sold his farm to his youngest son Gerald in 1962 and moved to Grande Prairie. Leonard died in February of 1971. Charles was a Swedish American veteran of the Philippine War. He came to Rio Grande in 1914. Charles served as a veterinarian in the American army during World War I. He returned to his land in Rio Grande in 1919. He raised Clydesdales and racehorses, did veterinary work, and made harnesses. Charles continued farming until he sold his land in 1943. He died sometime in the 1940s. Alexander was born in Glasgow, Scotland on March 7, 1888. He was a commercial traveler throughout the British Isles until 1912, when his brother William persuaded him to come to the Peace country. Alexander arrived in Spirit River in April of 1913 and filed on a homestead at SE 21-78-6-W6. He enlisted in the Canadian army in September of 1915. In September of 1916, Alexander received gunshot wounds to his right arm and left wrist at Courcelette; he spent six months, possibly more, in the hospital. In October of 1923, Alexander married Marie McNally, who had served as a nurse in the war, in Edmonton. In addition to farming, he served as secretary-treasurer of his municipality for many years. Alexander died on July 20, 1951. Donald was born in Glasgow, Scotland on October 6, 1890. As a twenty year old, he immigrated to Australia to get involved with raising sheep. Three years later, letters from his brothers Bill and Alexander persuaded him to try farming in the Peace country. Donald arrived in February of 1914 and filed on NE 21-78-6-W6. In July of 1915, he enlisted in the Canadian army. In September of 1916 at the Somme, Donald received a gunshot wound to his right foot. He spent six and a half months in hospitals and convalescent homes. After returning to the front, the wound reopened and Donald was put on light duty. After discharge, he was appointed Soldier Settlement Board inspector, a position which took him all over the Peace region. In 1923, Donald married Mary MacDonald MacDiarmid, a war widow. Two years later they moved into Grande Prairie. In 1928, Donald gave up his post as SSB inspector and went into business for himself - he moved to Sexsmith and opened a garage. Donald died in 1981. Marie was born in Bruce County, Ontario on June 29, 1892. She served as a nurse during World War I. In July of 1919 she returned to Canada, and was discharged in January of 1920. Marie married Alexander Innes in Edmonton in October of 1923. DeCourcey was born in New Zealand on October 12, 1877. At the age of 18 he got a job on a boat sailing for Canada. He traveled inland to the Okanagan Valley, where he met and married Mary Tonson. In 1904/1905, they moved to High Prairie, Alberta with their young family. 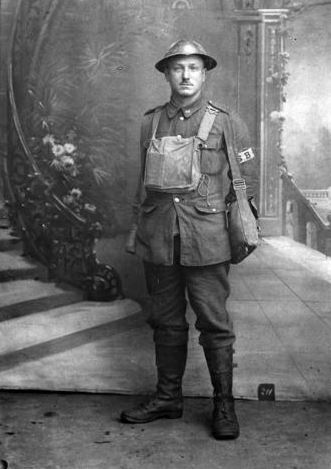 DeCourcey served in the Canadian army during World War I. In 1933, the Irelands moved to New Fish Creek and lived on a homestead at NE 2-73-22-W5. DeCourcey died on April 23, 1955. Peter served in the American army during World War I. After the war, he came up to the Bonanza district and filed on a homestead at NE 9-80-12-W6. He is buried in the Bonanza cemetery. John was born in London, England on September 21, 1881. At the time of his enlistment in July of 1915, he and his wife Elizabeth were living in Edmonton. 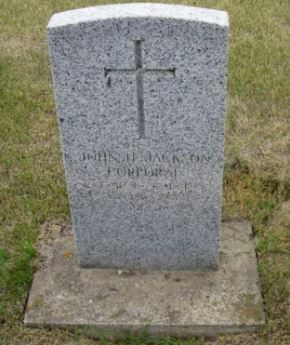 John died on January 2, 1958 and is buried in the Grande Prairie cemetery. Joseph was born in Millham, England on August 17, 1883. 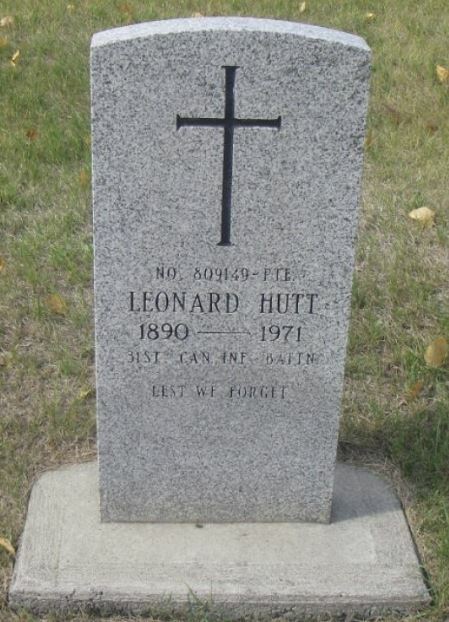 He and his wife, Bertha Louise, were living in Medicine Hat at the time of his enlistment in November of 1915. According to his service file, Joseph spent a great deal of time in hospitals with various illnesses. Joseph died on June 18, 1922 and was buried in the Grande Prairie cemetery. Sebastian was born in Sedan, Ardennes, France on April 14, 1889. He was living in Bender, Saskatchewan at the time of his enlistment in March of 1916. Sebastian settled in Guy in 1927 and filed on a homestead at SW 35-75-21-W5. He died on January 14, 1975. John was born in Arnprior, Ontario on September 11, 1883. He was farming in Grande Prairie at the time of his enlistment in March of 1916. In August of 1917 at Lens, France, John received a gunshot wound to his right leg. Later that year he was discharged, medically unfit because of his leg. John married a woman named Mary Ann. He died on December 24, 1935. George "Harry" was born in Staffordshire, England on July 20, 1899. He came to the Peace country in 1911 with his parents. In January of 1919, Harry enlisted in the Canadian army. He never left Canada and was discharged in July of 1919. Harry died a tragic death by burning (boating?) in 1933 at Great Bear Lake. Harry was born in Wallaceburg, Ontario on April 27, 1893. He came to the Peace country over the Edson Trail in October of 1913 and filed on a homestead one and a half miles north of Hythe the following spring. 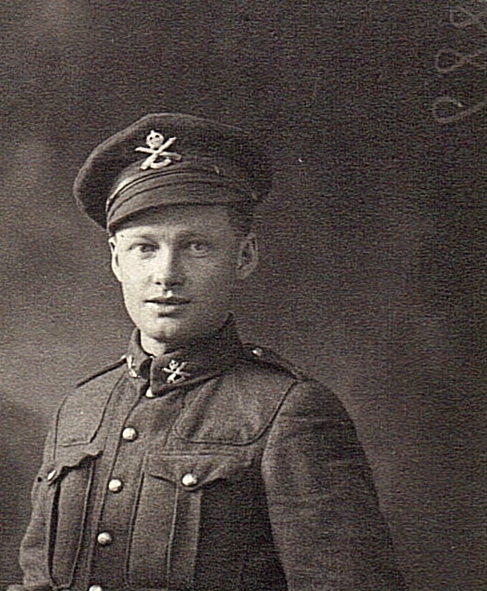 Harry enlisted in the Canadian army in July of 1915. In November of 1917, he received shrapnel wounds to his right arm and side. In December of 1917, while serving overseas, Harry married Agnes, a Scotswoman. They came back to Hythe in 1920. Harry died on February 3, 1956. Arne was born in Henningsvær, Norway on November 3, 1888. He was living in Saskatoon at the time of his enlistment in November of 1915, though at some point he had filed on a homestead at 9-78-4-W6. Arne went missing at Vimy Ridge and was presumed to have died "on or since April 10, 1917." Arthur was born in Johnson County, Kentucky in 1884. He came to Calgary in 1901, and became a Canadian citizen five years later. In 1914, Arthur joined the Canadian army. He returned to Canada in 1919 with his British war bride, Gladys Sarah Bowtell. The couple, along with their four young children, moved to the Beaverlodge area in 1928. Arthur died in 1959. Harry was born in Petersburg, North Dakota on November 24, 1897. He came with his family to Saskatchewan in 1905, and then to the Peace River country in 1913, where he filed on a homestead at SE 35-73-5-W6. 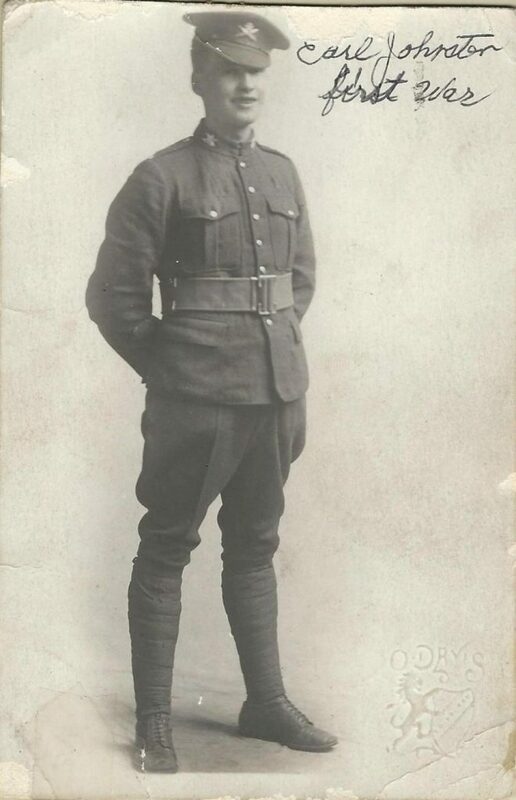 Harry enlisted in the Canadian army in Edmonton on July 20, 1915. On September 15, 1916 at Courcelette, he received gunshot wounds to both legs. Harry was invalided to Britain a few days later, and returned to France on June 9, 1917. In November of 1917, he contracted tuberculosis. On February 1, 1918, was once again admitted to a hospital and later invalided to Britain. Harry died on March 23, 1918 at 4:30 in the Canadian Special Hospital in Lenham, Kent, England. His grave marker is inscribed with "Beloved one farewell mother." Hedley was born in Brantford, Ontario on November 30, 1887. He came to Grande Prairie in October of 1910 and filed on a homestead at NE 34-71-5-W6. Hedley enlisted in February of 1915. On June 24, 1915, he married Carmelia “Carrie” Macklin in England. Hedley served only in England and Canada because of his flat feet and bouts of rheumatic fever. In June of 1915, there was some confusion as an H. Johnson was reported to have been killed in action. It turned out to be H. Hugh Johnston, and corrections were printed in the Grande Prairie Herald a week later. Hedley and Carrie arrived back to the homestead in February 1919, where they continued to live until they moved into Grande Prairie in 1928. In 1946, they moved to Rocky Mountain House. Hedley died in Edmonton on February 23, 1973. John was born in Tofield, Alberta on January 2, 1896. He came to the Peace country with his family in 1912 and filed on a homestead at NW (NE) 13-74-8-W6. 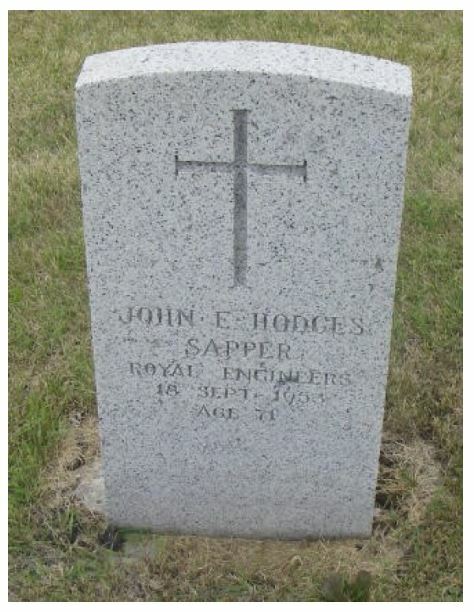 John was drafted in 1918 but served only in England. In 1922, he married Gertrude Fredland; the couple had four children. John continued farming until he retired in 1965, though he and Gertrude continued to live on the farm after his retirement. John died in Grande Prairie on April 13, 1978 and was buried in the Northfield cemetery. Nels was born in Aspas, Jamtland, Sweden in June of 1890. He immigrated to Canada in 1909 and was living in Grande Prairie when he was drafted in 1918. He never made it overseas and spent his time in the Canadian army just in Canada. In spring of 1920, Nels returned to Sexsmith and went into business as a blacksmith. He married Charlotte Cook Burns in 1930; Lottie had three children from a previous marriage. He continued working as a blacksmith until 1975. Nels died on February 24, 1979 and was buried in the Emerson Trail cemetery. Roy was born in Petersburg, North Dakota on November 18, 1896. He came to the Peace country in 1911 with his family. Roy was drafted in the summer of 1918, but never went overseas. 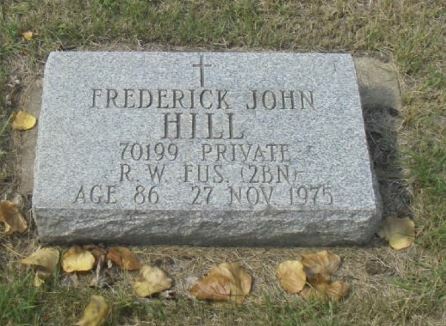 He died on June 21, 1963 and was buried in Lethbridge, Alberta. Andrew was born in Cape Breton, Nova Scotia on December 21, 1870. He was logging in Telegraph Creek, British Columbia when he enlisted in the Canadian Army in May of 1917. In 1920, Andrew filed on NW 23-78-24-W5 and SW 26-78-24-W5. Charles was born in Goderich, Ontario on November 7, 1893. He came across the Edson Trail in 1912 with his father, David Alexander Johnston, and five brothers. Charles enlisted in the Canadian army in May of 1917. Three of his brothers – William Earl, Willis David, and Hugh Norman – also served overseas. When he returned after the war, Charles married widow Marie Steffen, who had two children from her previous marriage. For three years he worked at the Bowness Sanatorium in Calgary. In 1923 he and his family moved to Bezanson (NW 25-71-3-W6, NE 26-71-3-W6). By this time Charles and Marie had had two children, Dorothy and Willis. In 1946 Charles sold his land and moved back to Ontario, though he returned to the Goodwin area in 1940 and filed on a homestead at 5-72-1-W6. Charles died in Grande Prairie on April 8, 1966 and was buried in the Goodwin cemetery. David was born in Mount Forrest, Ontario on August 6, 1882. He was living in Grande Prairie at the time of his enlistment in July of 1915, working as a blacksmith. On May 21, 1916, David received shrapnel wounds to his back and chest at Zillebeke, Belgium. According to his service file, he was living in Pincher Creek in 1922. David died on July 24, 1957. Norman was born in Goderich, Ontario on March 14, 1887. He came across the Edson Trail in 1912 with his father, David Alexander Johnston, and five brothers. 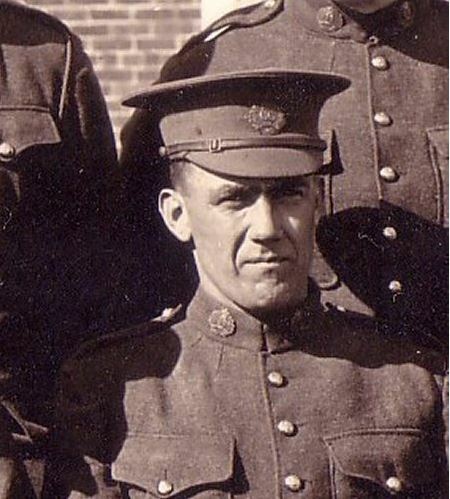 Norman enlisted in the Canadian army in September of 1914. Three of his brothers – William Earl, Willis David, and Charles Bell – also served overseas. On April 22, 1915, Norman was at the front for the Second Battle of Ypres. On April 23, he suffered a gunshot wound to his chest, which fractured his rib and punctured his left lung. Norman was reported missing on May 11, 1915, though on July 13 a letter he had written to his sister was published in the Grande Prairie Herald. He had been taken prisoner and hospitalized in Germany from April 24 until June 30. From that point on he was a prisoner of war and held at Camp Roeselare and Stendal. Norman was released when the war ended and arrived back in England on January 2, 1919. In April he returned to Canada and traveled back to his homesteads in the South Peace (23-71-3-W6 and 25-71-3-W6). He moved to Edmonton in May of 1928 to work as a plainclothes detective. Charles died in Edmonton on August 8, 1942 and was buried in the military section of the Edmonton cemetery. John was born ca. 1881 in New Brunswick. He filed on SW 20-72-26-W5 in 1919. Malcolm was born in Selkirk, Manitoba on February 27, 1874. As a young man, Malcolm served with the Canadian Mounted Rifles in the Boer War. After being discharged, he came to the Peace country and in 1910 settled in Spirit River. In July of 1916, Malcolm enlisted once again in the Canadian army. While invalided to England in October 1917, he married Lilly Veal Pierce of Kent. In November he was invalided to Canada. Malcolm had suffered from epilepsy since before the war; he suffered from weakness in his right arm and leg; and he had had a brain hemorrhage in France. On January 4 or 6, 1919, Malcolm died in Edmonton or Ponoka, just a few weeks after the death of his wife. His death was related to his war experience; some sources indicate that the cause was shell shock, though his service files make no mention of it. According to his service file, Norman lived in Dawson Creek/Pouce Coupe between 1919 and 1923. Earl was born in Goderich, Ontario on July 8, 1894 (1895?). He came across the Edson Trail in 1912 with his father, David Alexander Johnston, and five brothers. Earl enlisted in the Canadian army in March of 1916. Three of his brothers – Hugh Norman, Willis David, and Charles Bell – also served overseas. Earl was discharged in May of 1919 and returned to Grande Prairie; his homestead was located at NW 26-71-3-W6. In 1920, he moved to Edmonton and worked with the Edmonton Fire Department. Earl was married to a woman named Irene. In 1925, they moved to California, where Earl died on June 9, 1942. Willis was born in Goderich, Ontario in August of 1894. He came across the Edson Trail in 1912 with his father, David Alexander Johnston, and five brothers, and filed on a homestead at SE 26-71-3-W6. Willis enlisted in the Canadian army in September of 1914. Three of his brothers – Hugh Norman, William Earl, and Charles Bell – also served overseas. Willis was listed as dangerously ill and died of influenza on January 3, 1919 at the No. 62 Casualty Clearing Station, which was at Courtrai (Kortrijk), Belgium. Joseph was born in Matane, Quebec on September 26, 1896. He and his father were living in Girouxville when he was drafted in June of 1918. Though he shipped overseas, Joseph never saw active duty at the front lines in France and spent his time of service in England. According to his service file, Joseph lived in Quebec after the war. John was born on October 22, 1887 in County Wexford, Ireland. He came to Canada as a young man and worked as a miner around Barkerville, British Columbia. In October of 1915, John enlisted in the Canadian army. After discharge, he settled in the Teepee Creek area (SW 32-73-3-W6; NE 30-73-3-W6). He lived there until he sold his farm in 1942 and after taking a trip back to Ireland, John relocated to Vancouver. John died in Vancouver on April 25, 1967. Mark was born in Glen Ewen, Saskatchewan on October 7, 1888. His homesteads were located at 15-72-4-W6, 13-72-4-W6, 2-74-12-W6, 14-72-1-W6, and 22-72-4-W6 (Kleskun Hills and Lymburn). He joined the Canadian army on September 24, 1914. Mark injured left shoulder about 40 miles behind the lines; he was giving a horse some medicine when the horse threw up its head. He was hanging onto the halter and injured his shoulder. Mark required surgery to remove some new formation of bone in front of the shoulder joint, which caused him much discomfort even after surgery and massage therapy. On March 21, 1918, he was discharged in Regina, having been found medically unfit. According to his medical record, he had a 12 inch surgical scar. Mark married Margaret MacDonnell, a widow who worked as his housekeeper for a time. He died on September 18, 1965. Samuel was born in Bolton, Lancashire, England on November 16, 1891. He came to Canada as a young man and worked on a farm in Ontario. In July of 1915, Samuel enlisted in the Canadian army in Toronto. During his time overseas, he met and married Rosa Wynn Jack in Scotland. After the war they returned to Canada and came west to McLennan, where Samuel worked as a watchman with the Edmonton, Dunvegan, and B.C. Railroad. In 1929 he was promoted to engineer, a position he held until he retired in 1956. Samuel and Rosa had six children. Rosa died in McLennan in 1928, and in 1945 Samuel married Anna Reymer. They lived in McLennan until Samuel’s retirement, at which time they moved to Okanagan Falls, BC. Samuel died in December of 1966. Herbert married Louise Massey of Fort Francis, Ontario on June 26, 1919. 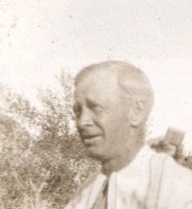 That fall Herb came to Grande Prairie looking for land and in May 1920 he brought his wife and their six month old daughter Kathleen to their homestead. Herb died in Grande Prairie on August 25, 1980 at the age of 87. Tommy was born in Arthur, Ontario on July 1, 1887. He filed on NW 23-71-8-W6 in 1910 and for some time worked as the manager of the Revillon Brothers trading post at Sturgeon Lake. Tommy enlisted in the Canadian army in September of 1915. He left Grande Prairie around 1920, though he returned to visit with his wife in 1922. Walter was born in Lubenham, Leicestershire, England on April 23, 1878. On December 14, 1904, he married Martha Edith. He served in the British Army during the Boer War, and in October of 1915 enlisted in the Canadian Army. In May of 1917, Walter suffered from trench fever and when he continued to have heart trouble afterward, he requested and was granted discharge in April of 1918. It was at this time that he brought his family to the Peace country, taking a homestead near Donnelly. In 1941 the Jordans moved to Wembley in hopes of finding better farmland. Walter died in Grande Prairie on January 11, 1966. Father Josse was born in St. Herblain, France around 1877. After completing his training for the priesthood, he was sent to Canada and arrived at Dunvegan on October 11, 1902. For a number of years Father Josse traveled around the Peace country on horseback to minister to the Catholics throughout the region. In July of 1917 he was called up to join the French Army for the duration of World War I. He served as Secretary of Staff of the 11th Legion initially, and later as an interpreter. During the Meuse-Argonne Offensive at the end of the war, Father Josse was awarded the Croix de Guerre for bravery while assisting the wounded under heavy artillery fire. After the war, he returned to Grande Prairie, where he remained until 1931 – at this time he was called to a professorship at the Seminary of Gravelbourg, Saskatchewan. Father Josse died on February 13, 1964 in St. Norbert, Manitoba, at the age of 87.